Edited by Tao Sun . We have made exciting progress in understanding the neural stem cells (NSCs) in the past twenty years. 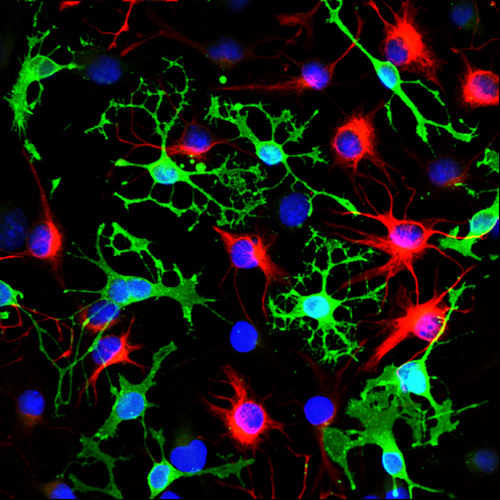 We have learned what genes control NSC proliferation and differentiation, discovered how to culture NSCs and trace their lineage in a culture dish, and have even developed methods to either stimulate endogenous NSCs to repair damaged neurons or transplant cultured NSCs to damaged regions in the central nervous system (CNS). Research from neurodevelopmental biologists using various invertebrate and vertebrate models, in particular rodents, has advanced the NSC field and accelerated therapy using NSCs. The notion of germinal cells in the neurogenic region, such as the ventricular zone (VZ) in embryonic human brains, came very early, in the 1870s. Later on, the advance of labeling techniques, in particular using the DNA replication marker [3H]-thymidine, allowed scientists to visualize dividing progenitors in primate and rodent brains. In embryonic mammalian brains, neuroepithelial cells are the first identified proliferating cells and they are in fact NSCs. These NSCs are then transformed into radial glial cells, which are now known as neural progenitors, and then intermediate progenitors. The proper proliferation of these progenitors is believed to be important for controlling brain size. Similar NSCs are also identified in other regions in the CNS, such as the spinal cord. The adult brain has long been recognized as a hard-wired system that neither generates new neurons, nor consists of NSCs. However, the observation of new neurons in the song bird brain has changed our view of adult neurogenesis. Using [3H]-thymidine labeling, dividing cells were detected on the wall of the lateral ventricle and, 30 days later, new neurons were detected in the high vocal center (HVC), a region that is believed to be responsible for song production. Furthermore, dividing cells were observed in the SVZ region of adult rodent brains and in the dentate gyrus (DG) region in the hippocampus of rodent and even human brains. Thus, in contrast to the previously held view of the hard-wired adult brain, new neurons are constantly generated in the SVZ and then migrate along the rostral migratory stream (RMS) into the olfactory bulb and the DG of the hippocampus, which may contribute to learning and memory aptitude. Numerous exciting studies have focused on illuminating the molecular mechanisms that regulate NSC proliferation and survival in both developing and adult brains. Many transcription factors and growth factors have been identified to control NSC proliferation and differentiation into various cell types. In recent years, epigenetic regulation of NSC development has also been revealed. Moreover, the niche that maintains NSCs has been realized. For example, the vascular system in the SVZ of adult brains has been shown to promote NSC proliferation. Parallel to the growth of our understanding of NSCs at cellular and molecular levels, our attempt to utilize NSCs for repair of damaged neurons in neurodegeneration disorders and injuries has also made significant progress. Cultured NSCs have been transplanted into the brains of stroke models and into the spinal cord after injuries, and significant recoveries have been observed. Moreover, it has been found that ischemia promotes the endogenous NSCs to proliferate and migrate into damaged regions. Taking the benefit of our knowledge of neurodevelopment and neural stem cell specification, embryonic stem cells (ESCs) have been used to produce NSCs and their progenies in cultures. The induced pluripotent stem cell (IPS) technology allows for NSCs to be generated directly from fibroblasts of patients with neurological disorders. Excitingly, recent studies have shown that fibroblasts can be reprogrammed directly into neurons by skipping the IPS step. Consequently, we are no longer restricted to post-mortem samples of patients with neurological disorders. These new technologies allow scientists to reprogram patient fibroblasts into NSCs or neurons, identify abnormal gene regulations responsible for these disorders, and screen potential drugs for treatment. We still face many challenges, such as the difficulty of producing homogeneous neuronal populations for transplantation, and the strain in leading new neurons to form synaptic connections with exiting neurons. However, there is no doubt that NSCs are becoming a promising means for treatment of neurological diseases and injuries. The publication of this book is timely. It contains the characterization of embryonic and adult neural stem cells in both invertebrates and vertebrates, and highlights the history and the most advanced discoveries in neural stem cells. This book provides the strategies and challenges of utilizing neural stem cells for therapy of neurological disorders and brain and spinal cord injuries. I am honored to have had this opportunity to work with over 20 authors on this book.The expertise and scientific contribution from each author has enriched the depth and broadness of the book and I have learned a tremendous amount from each and every one of them. It has been a great pleasure to work with the staff members at InTech Open Access Publisher. In particular, I feel fortunate to have worked closely with Mr.Vedran Greblo, who has coordinated the publication of this book from the beginning to the end. It is his professional insight in publishing, and his patience and encouragement that has made this book possible.